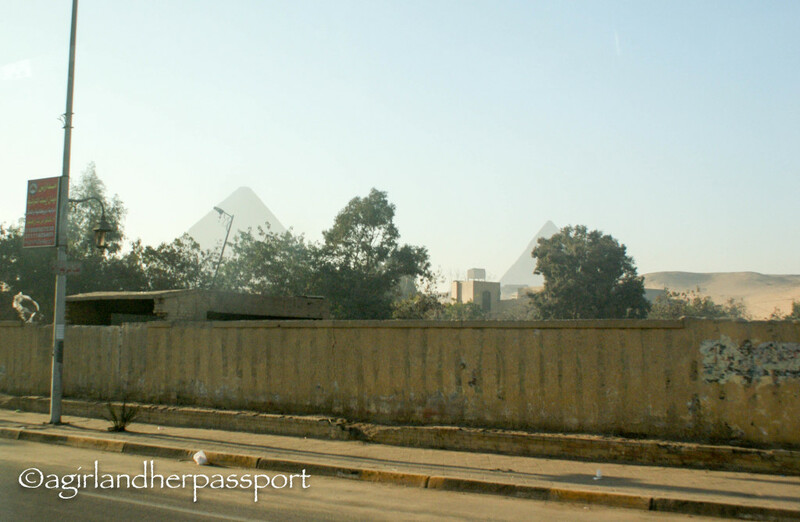 Driving through the streets of Cairo in the morning rush hour traffic, I began to glimpse the Pyramid tops through the haze of dust and pollution before we had even arrived at the gate. The gate brought more traffic as police inspected each car and van for anything out of the ordinary. The van made its way up the hill to the ticket area bringing more of the pyramid in view. 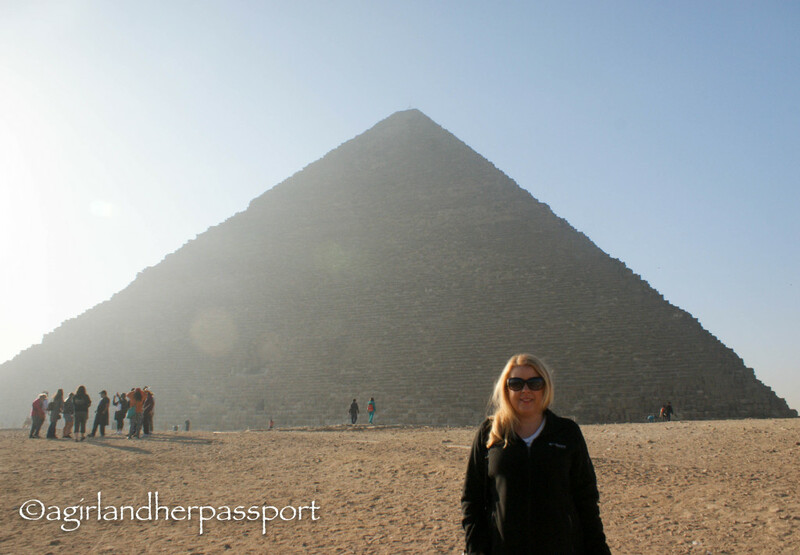 We passed through security again and turned to walk to the Great Pyramid. The rising sun hit the side of the Pyramid, and I realized it is much larger than I expected it to be. The stones at the based of the Pyramid are almost as tall as I am. It is so large you can’t take it all in at once and must walk the perimeter to see it all. The guide began to explain the history of the temple, but I can’t stand still to listen and roamed the outside of our group taking photos while listening. Not only did King Khufu build the tallest structure on earth for his time and for 3800 years after it continued to be the tallest structure, but he also picked a spot with what must have been an amazing view of the Nile River. 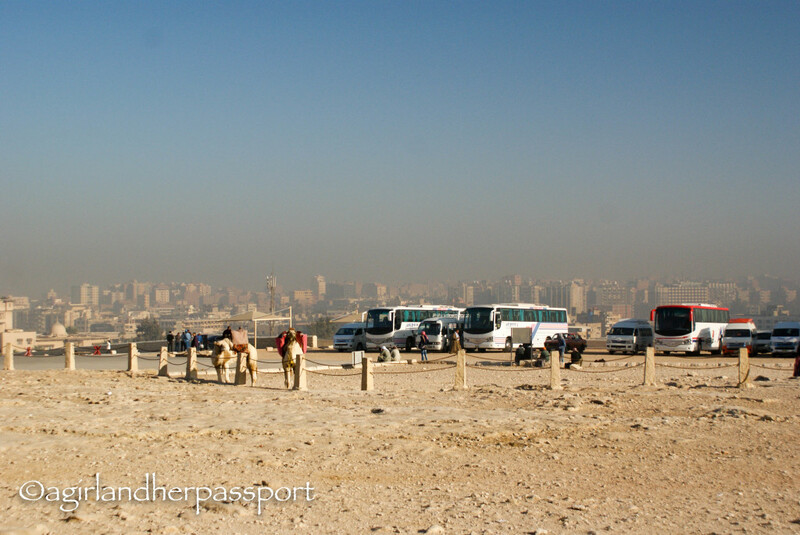 The view now is the sprawling city of Cairo and the town Giza, which have grown almost to the base of the Pyramid. From the west side of the Pyramid, you begin to see the other pyramids in the distance. 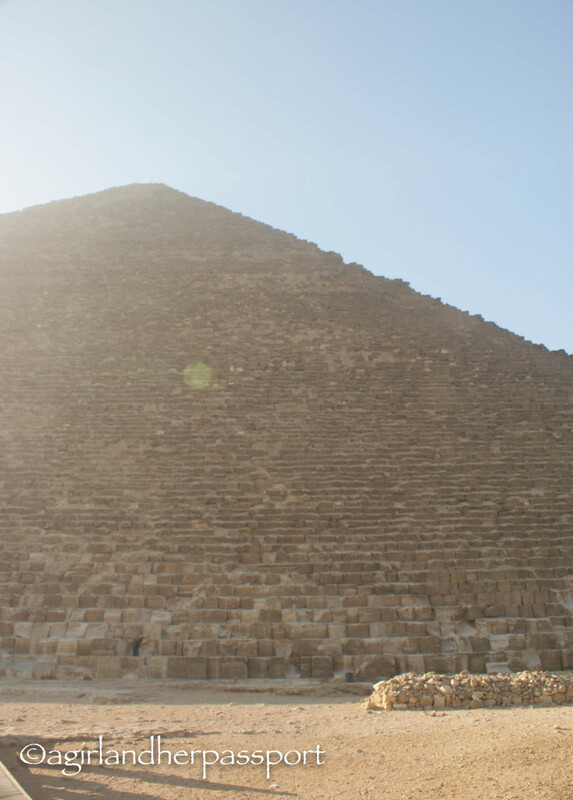 From photos, it seems close to the Great Pyramid, but in reality, it isn’t that close and walking there in my limited time frame wasn’t an option. Later in the day, it must stand in the shadow of the Great Pyramid. However, it is no less grand and still retains some of its outer limestone casing at the top. The third pyramid is not even visible from the ground in front of the Great Pyramid. After taking in the size of the Great Pyramid, I climb the stones to enter the Pyramid from the robber’s entrance not far from the base. The original entrance is much higher and is closed to the public. The tunnel is low and dark, and I have squat to climb it. After a few minutes, there is a much-needed break in climbing, and then you climb a ladder and squat climb again for a few minutes. Looking back, you realize you can’t see the entrance anymore, and you still aren’t there. I bent down under a giant granite stone into a small place to stand and then bend down again under another granite stone to enter the King’s Chamber. Inside is a room of granite. The whole room is made up of black granite stones that are perfectly smooth. The King’s sarcophagus is the only thing inside the chamber and is also entirely made of granite. Unlike the sarcophagi found in the Valley of the Kings, it is plain and is not smooth like the walls. The room is large and tall. 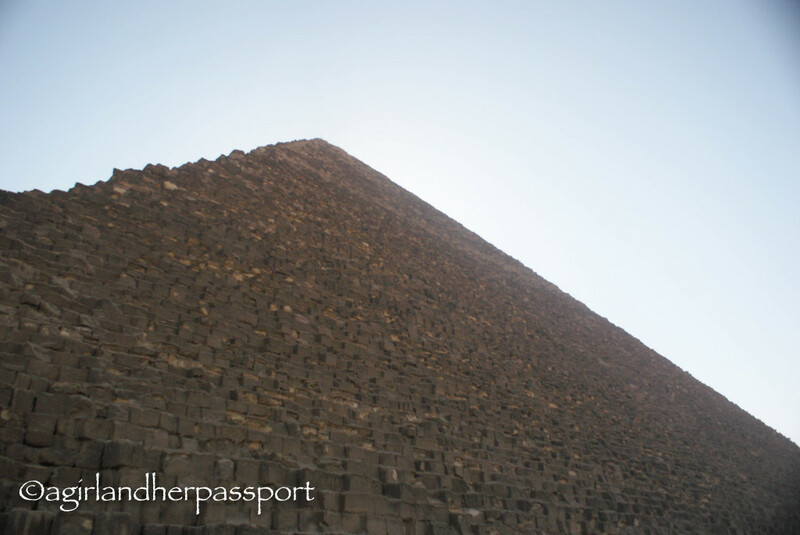 King Khufu had a sense of space and clearly understood that grandeur does not need to be overdone. Climbing down the tunnels is more difficult than going up, and I struggled not to hit my head or slide down the tunnel. As the day wore on, more people are entering the tunnel, and I have to share the climb down with people going up. However, my sore thighs the next day are worth it. 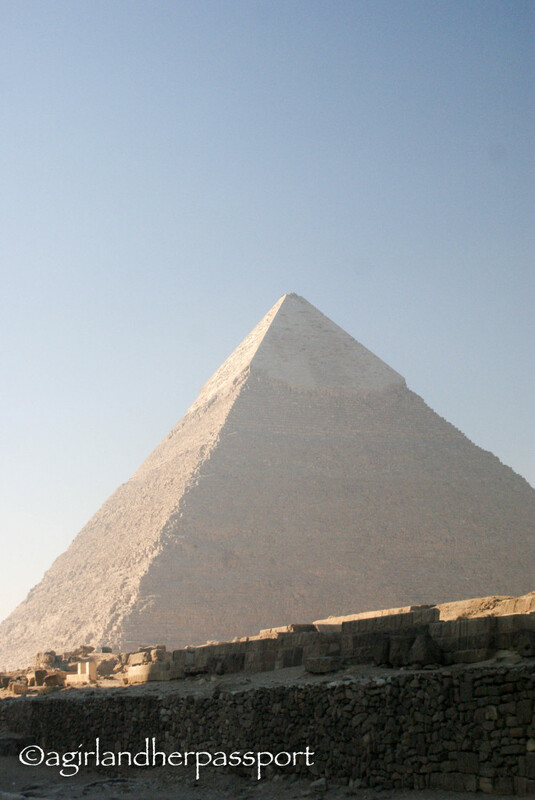 Nothing could have prepared me for the size of the Great Pyramid or getting to see the inside of this amazing structure. Getting there: You can take a taxi or public transportation to the Giza Pyramid complex, however, if you are not on a guided tour, take an Uber or Careem (Careem is the Uber of the Middle East). It is the best way not to have to haggle with a taxi driver. You can buy a ticket once you are there. 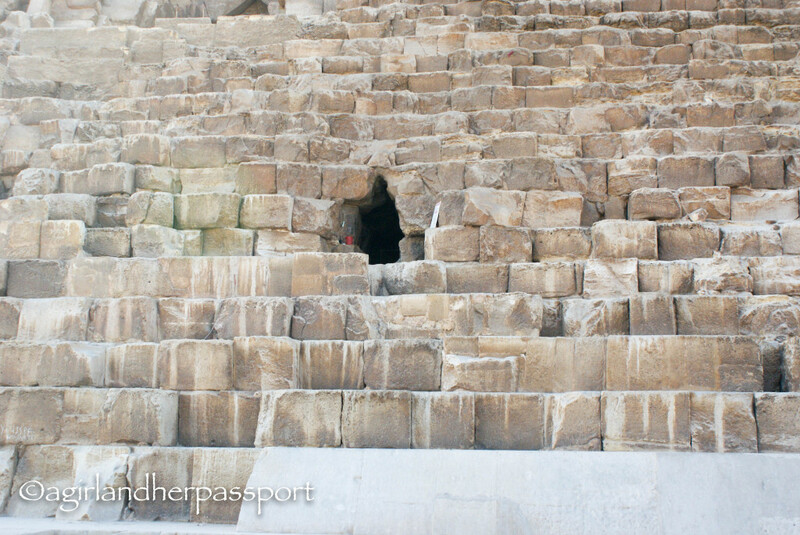 The ticket for going inside the Great Pyramid is an additional cost and must be bought at the ticket counter. 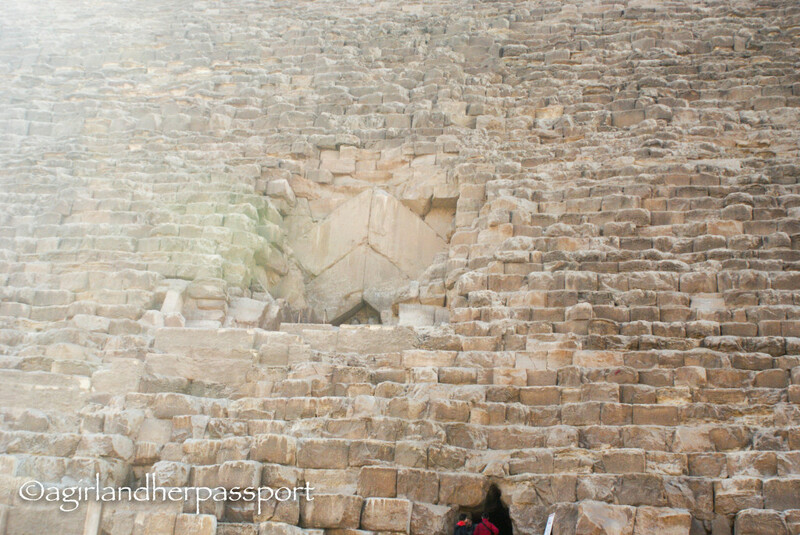 You cannot take your camera inside the Great Pyramid, though. 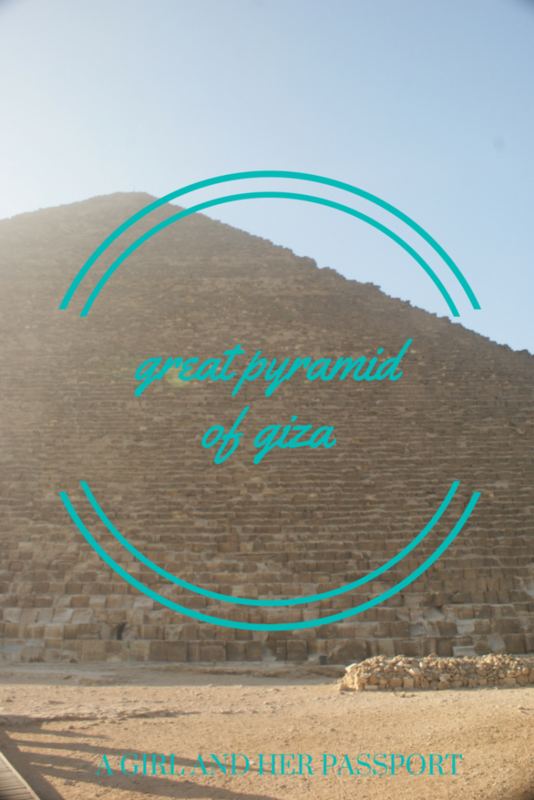 You can walk to the rest of the Pyramids and the Sphinx or hire a camel or horse cart. Be careful though as these people may try to charge you more at the end of the trip. Negotiate the price before you get on anything there and be firm with them. You are not being rude. The touts there are very aggressive and will try everything in the book to get more money from you. Do not let them follow you around giving you a tour, as they will want more money or baksheesh (tip) from you. 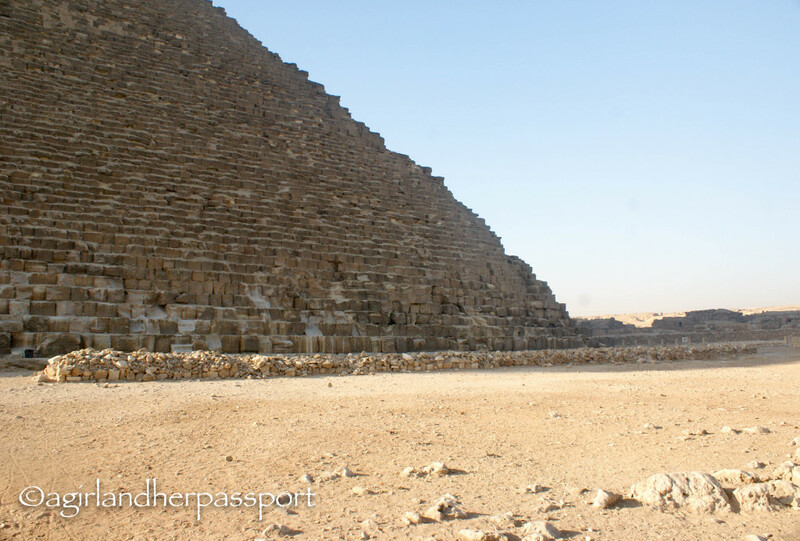 Go early and catch the sun rising over the pyramids and before it gets hot and more tourist show up. I’m so jealous – I’ve always wanted to go there! You should go! It was amazing and I never felt unsafe. Wow! nice 🙂 I wish to go there too! Take care. Thanks! I highly recommend going!